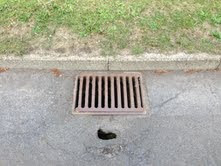 On Tuesday last week, while cycling along Rossie Avenue, I had to dodge riding into a hole beside the gully at the side of the road. While the hole in the road surface appeared to be small, it was quite deep and more extensive under the crust of the road surface. I took a picture on my phone and sent it to the Roads' Maintenance Partnership with a request that the hole was filled in. On Monday this week, I received confirmation that my inquiry had been investigated and as a result an order has been raised to repair the gully at this particular location in Rossie Avenue. Another job reported and sorted!